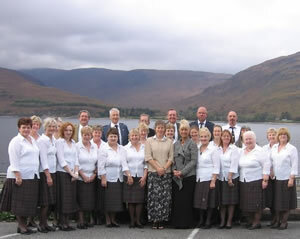 Aberfeldy & District Gaelic Choir achieved a commendable 4th place in the Puirt a Beul Competition at the Royal National Mod in Fort William on Friday 19th October. Competing against 13 other top Gaelic choirs, the Aberfeldy Choir was just 4 points behind the winning Glasgow Gaelic Musical Association, with Dingwall in 2nd place and Inverness coming in third. The winning Glasgow choir also went home with the coveted Lovat & Tullibardine trophy, with Aberfeldy placed a very commendable 6th out of 12 entrants in that competition. Lou added that the Gaelic marks awarded by the Lochaber judges were very high, and said that was down to sheer hard work from the choir members and their Gaelic tutor, Seonag Barbour. Aberfeldy's quartet Fuaimeach also achieved a very satisfactory result against some formidable competition in the Quartet class. Of the eight competitors, not one scored any less than 90 marks; Fuaimeach were awarded 93 and 92, with the winners Boireannaich Alainn scoring an unprecedented 95 and 94. The adjudicators remarked that never in their careers had they judged a competition of such high standard.